Sug Farrington, Extension Educator in Cimarron County received a sample of “worms” that were collected by a producer in his wheat field. They turned out to be army cutworms. Unlike the fall armyworm, this caterpillar overwinters in Oklahoma, tolerates cold and feeds throughout the winter months. Adult army cutworm moths migrate to Oklahoma each fall from their summer residence in the Rocky Mountains. They seek bare or sparsely vegetated fields (like a newly prepared field ready for wheat planting, or a field that was “dusted in” and had not yet emerged) and lay eggs from August through October. The eggs hatch soon after being deposited, which explains why a producer might see different sizes of larvae in a field. Army cutworms feed throughout the winter and molt seven times before they turn into pupae in the soil. Most larvae will be gone by late March and adult moths begin emerging in April and fly back to the Rocky Mountains to spend the summer. Army cutworms. Photo courtesy Sug Farrington, Cimarron County Extension Educator. 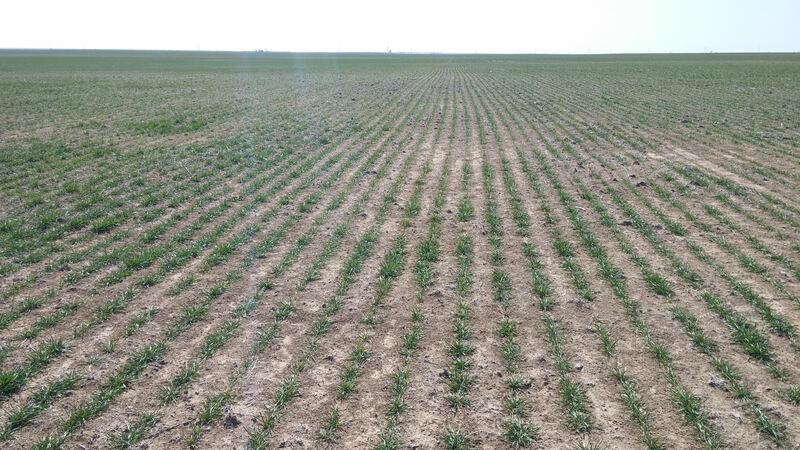 Army cutworms can cause severe stand loss of wheat if not controlled. 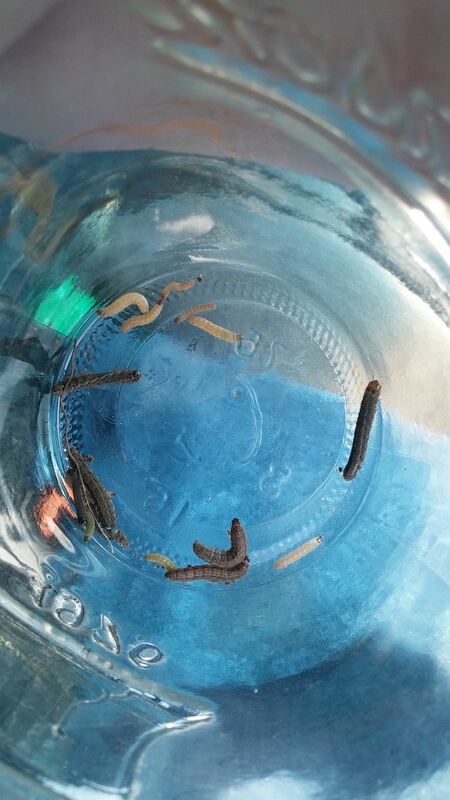 Cutworm damage often goes unnoticed through the winter because the caterpillars grow slowly and don’t get big enough to cause noticeable damage until temperatures warm in the spring. Unfortunately, that is also an indication of poor growing conditions due to drought (which cutworms also like), so it becomes important to check the fields for cutworms. If you notice a field at this time of year with a numbers of starlings or black birds feeding in a concentrated area of your wheat field, they are likely feasting on army cutworms! Army cutworm injury in wheat. Photo courtesy Sug Farrington, Cimarron County Extension Educator. Sample a field by stirring or digging the soil to a depth of two inches at 5 or more locations. Also, turn over those dried up cow patties, as they are a favorite hiding place for army cutworms. The cutworms will be “greenish grey”, and will probably curl up into a tight “C” when disturbed. A suggested treatment threshold is 2-3 caterpillars per foot of row when conditions are dry (like we are experiencing this winter) or 4-5 caterpillars per row-foot in fields with adequate moisture. Control suggestions are listed in Current Report-7194 Management of Insect and Mite Pests in Small Grains. Army cutworms are also a potential pest of canola. Scout fields just as you would in wheat. The suggested treatment threshold for cutworms in canola is 1-2 per row-foot. Current recommendations for control of army cutworms in canola are listed in CR-7667, Management of Insect and Mite Pests in Canola. By osuwheat in insects, Tom Royer on March 10, 2015 .